Despite the rise in taxation on CGT and transfers of property over R10 Million, an increase in Social grants of up to R90.00 monthly and a decrease in taxation for lower and middle income earners seems as though the rich will still carry on getting richer. 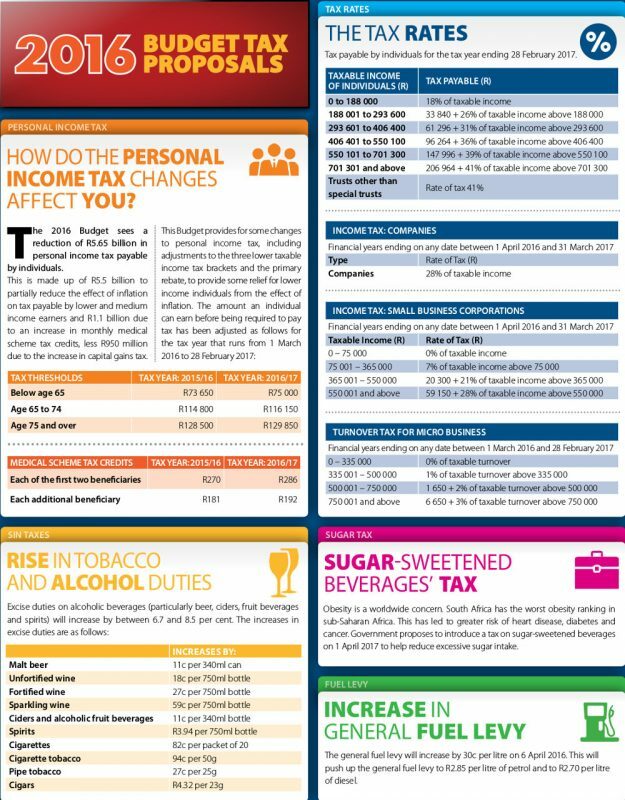 The 2016 Budget sees a reduction of R5.65 billion in personal income tax payable by individuals. This Budget provides for some changes to personal income tax, including adjustments to the three lower taxable income tax brackets and the primary rebate, to provide some relief for lower income individuals from the effect of inflation. The amount an individual can earn before being required to pay tax has been adjusted. Excise duties on alcoholic beverages (particularly beer, ciders, fruit beverages and spirits) will increase by between 6.7 and 8.5 per cent. Government proposes to introduce a tax on sugar-sweetened beverages on 1 April 2017 to help reduce excessive sugar intake. The general fuel levy will increase by 30c per litre on 6 April 2016.